Crude oil, which is composed of an estimated 500 different components, is processed by fractionation and refining techniques to produce a number of end products including liquefied gas, gasoline, diesel, heating fuel, lubricants and much more. In fact, the use of crude oil can also be utilized in the chemical industry for the production of plastics, textiles, dyes, cosmetics, fertilizers, detergents, building materials and pharmaceuticals. As the major source of lubricants utilized in the global market, the processing of crude oil requires approximately 33% of our energy demand. Crude oil is first desalted and then separated into several intermediate materials through the use of an atmospheric or crude distillation unit (CDU), depending on boiling temperature. To satisfy the high global demand for gasoline, the heavier side cuts from the CDU are reformed and resolved to increase the light intermediate materials which subsequently also increases the number of gasoline fractions produced by this process. One important overhead distillate fraction is known naphtha, which is a mixture of C5 to C10 hydrocarbons, and is produced from relatively light components. Naphtha is often utilized as a raw material by ethylene plants. Detail of refining, cracking, and separation processes focusing on naphtha gas stream with stars noting suggested NIR measuring points. It is important to note that the quality of the fractions obtained by the CDU must be monitored continuously to ensure that it is operating efficiently. When the crude feed has a large concentration of impurities, cause corrosion and fouling in the refining process can occur. Additionally, certain operating conditions such as the temperature of the crude column overhead, crude and reflux, as well as the water wash and overhead vapor water content can promote corrosion and fouling to arise. The presence of water in the CDU can also cause problems, as it can absorb the acids and amines and eventually vaporize as reflux flowing down the column. As the heated salts are deposited within the column, they can eventually accumulate and cause a high pressure drop, resulting in a loss of efficiency and profit. 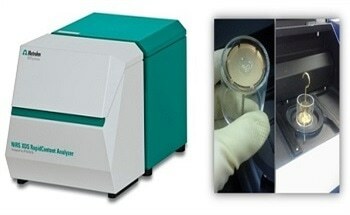 Determining the water content of crude oil, refined petroleum products, fuels, biofuels, lubricants and other similar products is extremely important to ensure quality control, meeting trade specifications, the protection of the financial value of the products, as well as the enhancement process optimization. Determining the accurate water content present in hydrocarbons enables the refinery to take steps to reduce risks that can occur from corrosion, safety problems and infrastructure damage, all of which can be caused from unwanted water content levels present in these oil byproducts. A safe and rapid way to monitor the water content present within the CDU overhead fractions is inline with reagent-free near-infrared spectroscopy (NIRS). Spectroscopy offers numerous advantages over the more commonly used wet-chemical analytical methods. 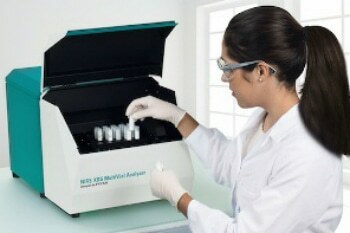 NIRS in particular is a rapid and economical technique that allows for the qualitative and quantitative analysis of products in a noninvasive and nondestructive method. In fact, NIRS is an indispensable analysis technique that can simultaneously determine a diverse range of parameters in seconds. By utilizing NIRS in the manufacturing process of these products, all materials ranging from those undergoing initial processing to finished products can be accurately and quickly evaluated. Metrohm’s NIRS process analyzers enable the comparison of real-time spectral data from the process to the primary method to create a simple and indispensable model for any crude oil manufacturer’s needs. To gain more control over the production of crude oil and similar products, a Metrohm Process Analytics NIRS XDS system are capable of monitoring up to 9 different process points when equipped with the multiplexer option. The Metrohm Process Analytics NIRS XDS can also be configured for applications in ATEX zones. Data correlation between primary method and NIR model illustrating how accurate the correlation is between methods. 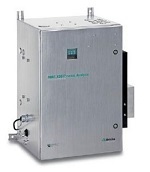 NIRS XDS Process Analyzer configured for applications in ATEX areas.